We've all heard of the wild parrots of San Francisco, made famous by Mark Bittner in his best selling book and Judy Irving's documentary The Wild Parrots of Telegraph Hill. Doing some research in The Seattle Times Newspaper archives, I ran across a couple of articles regarding the locally known feral parrots in Seattle's Seward Park. Apparently the Seward Park parrots were established by 1995 beginning with a group of three parrots, with another report in the newspaper as late as 2003. The parrots are even featured on the website of The Friends of Seward Park, which describes their location as the north bluff of Pinoy Hill. The parrots are Mitred conures (Aratinga mitrata). This got me to thinking that it might be of interest to do a census of feral parrots throughout the Pacific Northwest. The Audubon Society does a bird count every year. Maybe a parrot count is in order! There are at least three known (but not necessarily documented) groups of feral parrots here in Seattle: the Seward Park bunch, and another in the Maple Leaf neighborhood of northeast Seattle (which may or may not be the same parrots), documented just this year as far north as Shoreline, Washington, just north of Seattle. I've also heard of a flock of conures that supposedly escaped from Woodland Park Zoo on Phinney Ridge many years ago. I regularly encounter people who claim to have seen the birds, so I'm pretty confident that they exist. I'm curious where there might be other flocks of parrots established within the Pacific Northwest. Of course there is the notorious group of Quaker parrots in Yacolt, Washington, near Vancouver and Portland. Quakers are also know as Monk parrots (Myiopsitta monachus). Currently seventeen (17) individual parrots have been counted. And I understand there is a group of Quakers established on the Oympic Peninsula in Port Orchard, Washington. I have heard that at least one flock of Quakers in Port Orchard is doing well. There was a fairly large flock with more than twenty (20) individual parrots located on Mitchell Street which apparently was eradicated in the dead of night, probably by a local utility company. Several flocks of Quakers are established in Oregon. The State of Oregon has determined that Quaker parrots are not an agricultural threat and there are no official eradication efforts in the state. Feral Quaker or Monk parrots were first documented in Oregon in 1977 when one was killed by a dove hunter in North Portland. Also in 1977 a pair escaped from captivity and built a nest on a power pole in southeast Portland. By 1980 a colony of 10 birds could be found at this location, but the nests were abandoned by 1984. About 1980-1981 Monk parrots were reported from several locales in the northeastern and southeastern Portland area and a large stick nest was constructed near Portland International Airport. The colony flourished and several nests were added. Up to 24 birds have been counted at the nest, but it is suspected that these nests are being abandoned. Recently, there have been up to five active Quaker nests counted in Oregon White Oak trees around Portland International Airport. There is also a nest near Scio, built in 2000 on a telephone pole, that at one time contained up to 8 birds, but is believed to be currently abandoned. 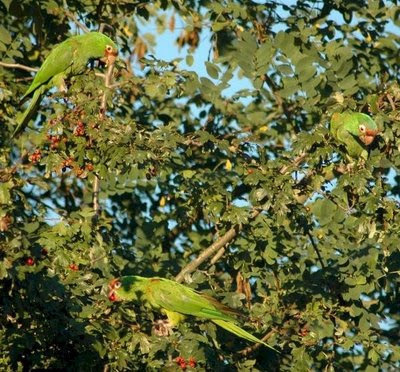 There have been sporadic sightings of Monk parrots in Deadwood, Hillsboro, Gaston, Oregon City, and even in some northern Oregon coastal regions. Thanks to Donna Burleigh of S & D Exotic Bird Rescue for the information about Oregon parrots! The Columbia Citizens blog of the Columbia City neighborhood in Seattle recently posted an update about the Seward Park parrots, with photographs of some of the parrots taken May 19th and May 20th. They were sighted in the area of 49th Avenue South and Hudson Street, as well as 43rd Avenue South and Ferdinand Street. One longtime resident noted: In years past, maybe ten or twelve years ago, we counted fourteen conures at one time. More recently the numbers seem to be dwindling…these days we see three or four maybe in our neck of the woods, 43rd Avenue and Ferdinand Street. I was told they've been around for a long time and originated with a bird (or two) flying out of someone's open window. And thanks to Christopher Driggins of Northwest Bird Rescue and Adoption for this link to his blog updating the status, with photographs, of the Yacolt Quaker parrots. and what a beautiful story you did about the wild parrots in the North West.